Sky Map: The sky April 7 at 8 p.m. local time from mid-northern latitudes. The month of March is finally behind us. It's the month you're happy to see arrive, but even happier to see depart. Considering all the wild variations of weather that March brings, I sometime note on my television weathercasts that it comes in like a lion, goes out like a lamb . . . and usually gets your goat! Now that we are into April, there is the promise of milder nights to come and a lure for skywatchers to spend more time under the sky as opposed to the icy cold nights of winter. The oft-quoted adage that March "comes in like a lion, goes out like a lamb"-usually refers to blizzards and mild weather. But just perhaps these images also came to mind because in the late winter, early evening sky we can see Bootes, the Herdsman following Leo, the Lion over in the eastern sky. Spring is also the time of the year when herdsmen and shepherds spent their nights out in their fields, since this is the time when lambs are born. In the allegorical sky pictures of star atlases of a few hundred years ago, Bootes is usually pictured holding a large rod or staff. Ironically, it is not Leo that Bootes is chasing after, but Ursa Major, the Great Bear. This is why some legends refer to Bootes as "The Bear-guard." On our sky map Bootes resembles a narrow kite, but it might also be envisioned as an ice-cream cone. At the bottom of the cone shines brilliant Arcturus-fourth brightest star in the sky. Since it has an orange hue, we might say that the cone was holding orange sherbet, and perhaps somebody bit off the bottom of the cone allowing the last little glob (Arcturus) to dribble out. 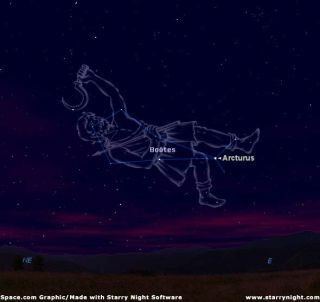 Arcturus is a giant star, fully 25 times the diameter of the Sun and 115 times as luminous. It was 73 years ago that Arcturus became the object of a big publicity build-up in Chicago, at the opening of the Century of Progress Exposition. Telescopes equipped with photoelectric cells focused this star's light, and the current generated was used to activate the switch to turn on the floodlights at the exposition grounds. Arcturus was chosen because Chicago had a great World's Fair in 1893. Estimates say light from Arcturus required 40 years to reach the Earth. So a story was built around the fact that the 1933 fair would be opened by light that had started its trip while the 1893 fair was still in progress. A footnote to this interesting story is that our more accurate measurements today place the light-time distance of Arcturus at 37 years. So it was really starlight that started toward Earth in 1896 that turned on the lights of the 1933 fair.
" . . . or canst thou guide Arcturus with his sons?" Could this refer not to the star's nightly travels across the sky but to its proper motion, which during the millennia spanning ancient times was certainly great enough for careful observers to notice? We may never know for sure.